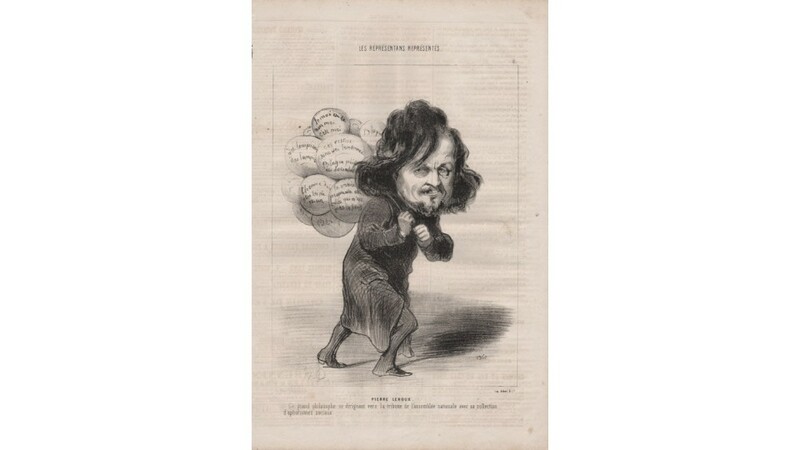 French 19th century portrait caricature by Honore Daumier. PIERRE LEROUX. 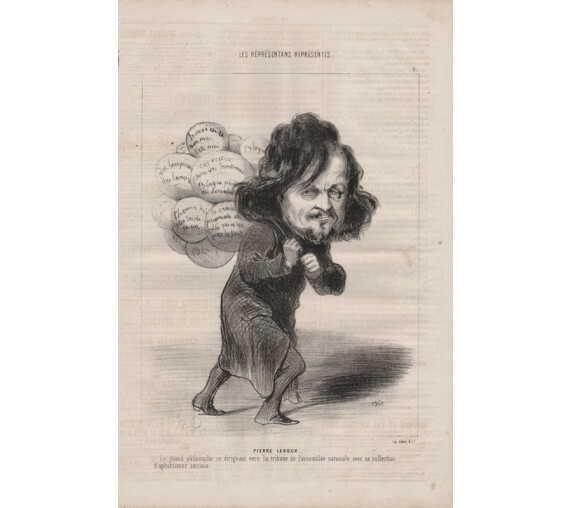 Ce grand philosophe se dirigeant vers la tribune de l'assembl_e nationale avec sa collection d'aphorismes sociaux.' 'PIERRE LEROUX. We see this great philosopher and specialist in social aphorisms, aiming for the rostrum at the National Assembly.' Pierre-Henri Leroux (1797 - 1871) was a deputy and philosopher, writer and a friend of George Sand. He was a director and founding member of the following papers: "Globe", "Revue encyclopedique", and "La Republique". He lived in exile in England between 1851 and 1869. During 1848, he was the official theorist of the socialist school. Original lithograph by Honore Daumier published in Paris in 1848. From a series titled 'Les Representans Representes' (The representative represented) depicting the portraits of the 'Assemblee Constituante' (Constituent Assembly) and the 'Assemblee Legislative' (Legislative Assembly). Honore Daumier (1808-1879), was a French printmaker, caricaturist, painter, and sculptor, whose many works offer commentary on social and political life in France in the 19th century. Text on the reverse as issued. Faint ink off-setting.